A primary reason people procrastinate is because it satisfies. Think about it…doing something that generates immediate gratification feels more pleasurable than doing something that is more important yet not as enjoyable. However, while procrastination promises ease, relaxation, and happiness, its promises are empty. Instead of ease, it delivers struggles. Instead of relaxation, it leads to sloth. Instead of happiness, it creates emptiness and depression. How can you fight back against procrastination? Start with trying these 3 simple ideas on how to beat procrastination. Sounds simplistic, but often the simplest ideas are the most powerful. If you want a surefire way to beat procrastination, start with getting up right away each morning. When you hit the snooze button first thing in the morning, by default you start your day off with a strike against you. So instead of striking out before your day even starts, get up and get going immediately. Another idea on how to beat procrastination is to make sure you exercise regularly. You don’t have to become a marathoner or a gym rat; any sort of exercise will energize you, make you healthier, and increase your happiness quotient. As a side note, check out this post on the power of exercising: 10 Reasons Why I Run (Ideas on How to Improve Yourself). In the GOAL GETTING Video Coaching Program, I share the following thought: “Most people wait for motivation before taking action. Yet this equation is backwards! Energy is a result of action.” The best idea to beat procrastination is to start each day knowing exactly what your #1 priority is for the day. If you articulate your #1 priority and then dedicate as little as one hour to getting after it, you’ll be shocked at how successful your day will become. The reason? No matter what else happens that day, you will have focused some time on what matters most. 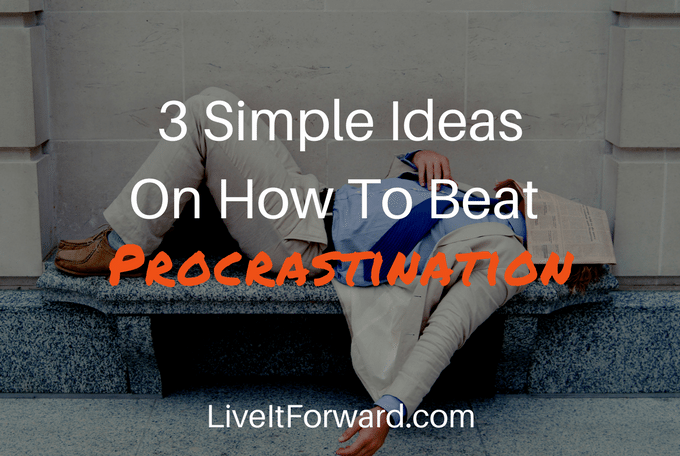 Question: Do you have other ideas on how to beat procrastination? Please share them.